This week, Notre Dame Law will host the Advisory Committee on the Federal Rules of Appellate Procedure at its Chicago facilities. Professor Amy Coney Barrett, Diane and M.O. Miller, II Research Chair in Law, is a member of the committee. The committee will meet Thursday and Friday Oct. 29-30 at the Notre Dame Law Suite on Michigan Ave. The committee, which consists of a small group of judges, law professors, and practicing lawyers, studies the operation and effect of the rules of practice and procedure applicable in the federal appellate courts. 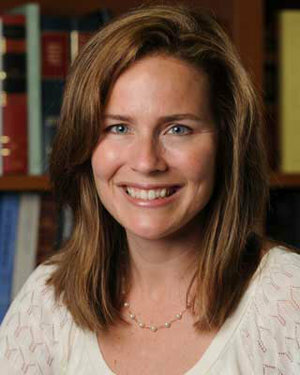 Barrett was appointed by U.S. Supreme Court Chief Justice John Roberts to the Advisory Committee on Appellate Procedure in August of 2010 and is serving her second three-year term. Advisory committees evaluate suggestions for amendments to the federal rules. Any proposed amendment must be approved by the Standing Committee, the Judicial Conference, and, ultimately, the Supreme Court. If the Supreme Court promulgates a rule, it becomes effective unless Congress enacts legislation that rejects or modifies it. Judge Steven M. Colloton of the Court of Appeals for the Eighth Circuit is chair of the committee. Gregory E. Maggs, a professor at George Washington University Law School, is the committee’s reporter. Other members of the committee are: Judge Michael A. Chagares, Court of Appeals for the Third Circuit; Justice Allison H. Eid, Colorado Supreme Court; Gregory G. Katsas, Jones Day; Neal Katyal, Hogan Lovells and professor at Georgetown Law; Judge Brett M. Kavanaugh, Court of Appeals for the D.C. Circuit; Judge Stephen Joseph Murphy III, District Court for the Eastern District of Michigan; Kevin C. Newsom, Bradley Arant Boult Cummings; and Hon. Donald Verrilli, Solicitor General of the United States (ex officio). Originally published by Lauren Love at law.nd.edu on October 27, 2015.